Forum » News / Front-page » South Africa appeals against OOXML, call your Standards Body now! The South African Standards Body SABS have lodged an appeal against the awful fast-track process of DIS29500, or Microsoft Office OpenXML. Please call your Standards Body and ask them to support this complain. You have only 7 days because the deadline is 30 May, 2 months after the ISO vote. 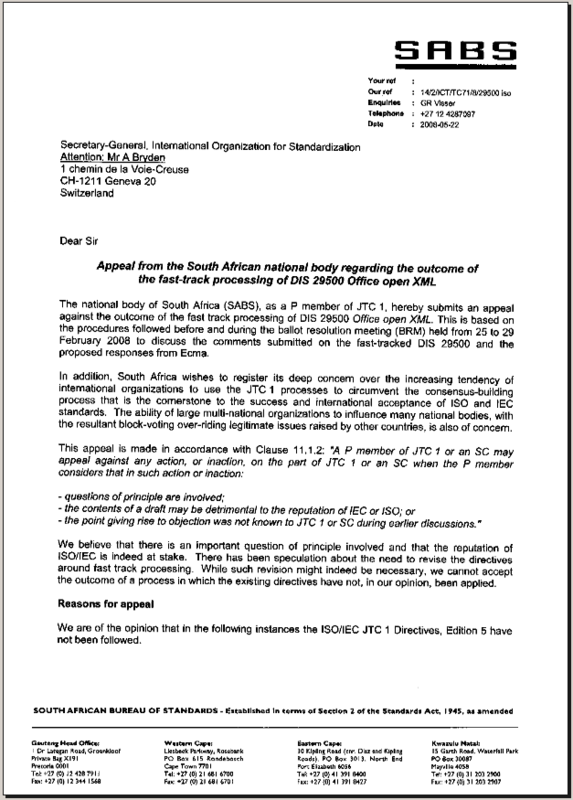 The national body of South Africa (SABS), as a P member of JTC 1, hereby submits an appeal against the outcome of the fast track processing of DIS 29500 Office open XML. This is based on the procedures followed before and during the ballot resolution meeting (BRM) held from 25 to 29 February 2008 to discuss the comments submitted on the fast-tracked DIS 29500 and the proposed responses from Ecma. * the point giving rise to objection was not known to JTC 1 or SC during earlier discussions." We believe that there is an important question of principle involved and that the reputation of ISO/IEC is indeed at stake. There has been speculation about the need to revise the directives around fast track processing. While such revision might indeed be necessary, we cannot accept the outcome of a process in which the existing directives have not, in our opinion, been applied. We are of the opinion that in the following instances the ISO/IEC JTC 1 Directoves, Edition 5 have not been followed. 1. Clause 13.4, second paragraph states "During the 30-day review period, a NB may identify to the JTC 1 Secretariat any perceived contradiction with other standards or approved projects of JTC 1, ISO or IEC. If such a contradiction is alleged, the matter shall be addressed by the ITTF and JTC 1 Secretariat in accordance with Section 13.2 before ballot voting can commence. If no contradiction is alleged, the 5 month fast-track ballot voting commences immediately following the 30-day period. If a contradiction is alleged, the JTC 1 Secretariat and ITTF shall make the best effort to resolve the matter in no more than a three month period, consulting with the proposer of the fast-track document, the NB(s) raising the claim of contradiction and others, as they deem necessary. A meeting of these parties, open to all NBs, may be convened by the JTC 1 Secretariat, if required"
Whereas various NBs raised contradictions in this period, there is no evidence that "A meeting of these parties, open to all NBs" was held and that the result were made available to the other participating NBs. We understand that after Ecma was afforded a chance to address the NB comments submitted regarding contradictions, the JTC 1 Chairman, Secretariat and ITT F staff decided that convening a meeting to discuss contradictions would not be productive and that the best way to proceed would be to issue the draft for ballot without delay. The other NBs were not informed about the alleged contradictions but only informed, in the HOD meeting immediately prior to the BRM, that any issues of contradictions raised during the BRM would be ruled out of order by the BRM Chairman. 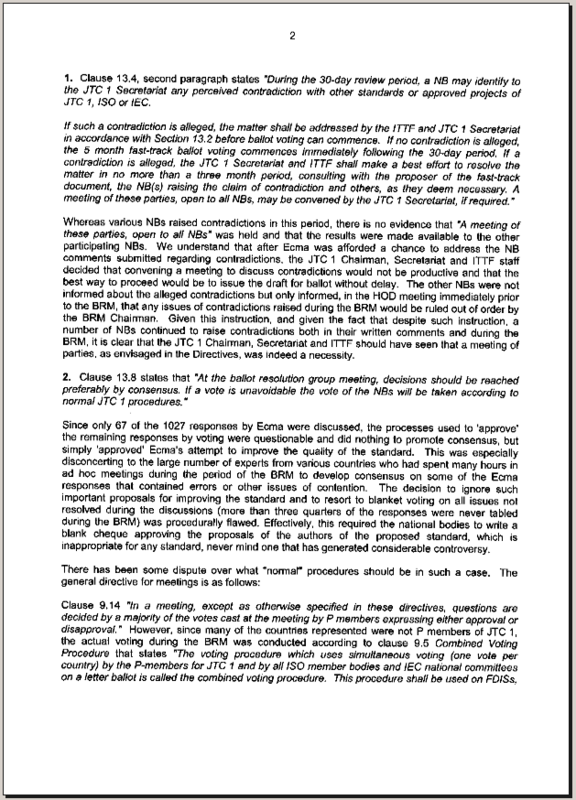 Given this instruction, and given the fact that despite such instruction, a number of NBs continued to raise contradictions both in their written comments and during the BRM, it is clear that the JTC 1 Chairman, Secretariat and ITTF should have seen that a meeting of parties, as envisaged in the Directives, was indeed a necessity. 2. Clause 13.8 states that "At the ballot resolution group meeting, decisions should be reached prefably by consensus. If a vote is unavoidable the vote of the NBs will be taken according to normal JTC 1 procedures." Since only 67 of the 1027 responses by Ecma were discussed, the process used to 'approve' the remaining responses by voting were questionable and did nothing to promote consensus, but simple 'approved' Ecma's attempt to improve the quality of the standard. This was especially disconcerting to the large number of experts from various countries who spent many hours in ad hoc meetings during the period of the BRM to develop consensus on some of the Ecma responses that contained errors or other issues of contention. The decision to ignore such important proposals for improving the standard and to resort to blanket voting on all issues not resolved during the discussions (more than three quarters of the responses were never tabled during the BRM) was procedurally flawed. Effectively, this required the national bodies to write a blank cheque approving the proposals of the authors of the proposed standard, which is inappropriate for any standard, never mind one that has generated considerable controversy. Clause 9.14 "In a meeting, excet as otherwise specified in these directives, questions are decided by a majority of the votes cast at the meeting by P members expressing either approval or disapproval." However, since many of the countries represented were not P members of JTC 1, the actual voting during the BRM was conducting according to clause 9.5 Combined Boting Procedure that states "The voting procedure which uses simultaneous voting (one vote per country) by the P-members for JTC 1 and by all ISO member bodies and IEC national committees on a letter ballot is called the combined voting procedure. This procedure shall be used on FDISs, DISs, FDAMs, DAMs and FDISPs." The decision to use this interpretation was incorrect since the voting during the BRM was not a letter ballot. While we are aware that the Convenor, in consultation with representative from ITTF and the IEC representative decided otherwise, we challenge this interpretation and therefore the result of the voting that was based upon that interpretation. 3. Clause 13.12, last bullet point: "In not more than one month after the ballot resolution group meeting the SC Secretariat shall distribute the final report of the meeting and final DIS text in case of acceptance." Up to date of writing, neither the final report of the BRM meeting or the revised FDIS text has been circulated by the SC Secretariat. 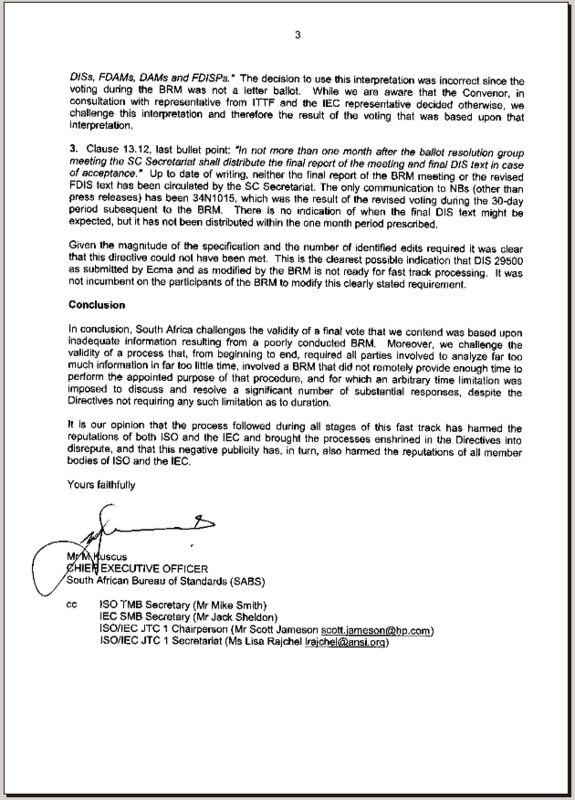 The only communication to NBs (other than press releases) has been 34N1015, which was the result of the revised voting during the 30-day period subsequent to the BRM. There is no indication when the final DIS text might be expected, but it has not been distributed within the one month period prescribed. Given the magnitude of the specification and the number of identified edits required it was clear that this directive could not have been met. This is the clearest possible indication that DIS 29500 as submitted by Ecma and as modified by the BRM is not ready for fast track processing. It was not incumbent on the participants of the BRM to modify this clearly stated requirement. Re: South Africa appeals against OOXML, call your Standards Body now! 950002, as such IPQ has nothing to add. According to ISO spokesman Roger Frost, "Because the period for receipt of appeals remains open until the end of May, ISO will communicate on the next steps in early June, when it knows whether any other national bodies are appealing."